Natural Forest Practice - By burning logs am I damaging the woodland? Diverse, rich, abundant and humid, it is one of the most rich and productive environments on Earth. Typical of the Amazon. sketches – Paul Goetzee - edited 30-09-2015. When considering how crucial moisture is to a woodland, the benchmark must surely be the tropical rainforest. Diverse, rich, abundant and humid, it is one of the most productive environments on Earth: predators and prey, growth and decay, fruits, flowers, pollinators, fungi and a rich leaf-litter. The essential element common to both is water. So what holds water in the woodland? Our woodlands in the UK are small, fragmented and thus vulnerable to drying-out. We must take special care. This webpage has been written with the purpose of enabling you, the owner/ forester, to consider the role moisture plays in creating a healthy woodland environment. Each woodland has its own unique features, and we aim to guide you to a better understanding of what you are dealing with in your own woodland. Every owner should assess their woodland with a view to improving its situation. As climate change becomes more apparent, understanding how your woodland works will become increasingly important to plan ahead and put in to place protective intervention. Humidity is important because saturated air allows leaves to open their pores and take in more carbon dioxide, without at the same time losing moisture. 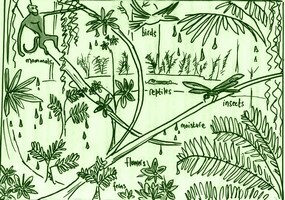 It slows transpiration. Moisture content in the air is all too often over-looked but distinguishes a healthy woodland from one in need of care. We can’t always ‘see’ how much moisture is held in the air, but can more readily ‘feel’ a dry or a damp clammy atmosphere, at its most graphic in summer by a close, uncomfortable, muggy atmosphere. Relative humidity is the most common measurement. It measures how much water vapour is in the air compared to how much there could be at that temperature (warmer air can contain more moisture). It is expressed as a percentage, where 100% is saturation point. A glance at the Met Office forecast in the UK reveals erratic changes in humidity hour by hour, day by day. How does this affect your woodland? The answer is complex, because aspect, altitude, shelter and proximity to water, all affect the microclimate locally. Higher humidity may be indicated by the distribution and species of ferns and bryophytes in the woodland. South facing woodland is characterized by a warm, dry environment, with generally few ferns or mosses, whereas north facing is usually shady and damp, with more ferns and mosses. My woodland in Wales has both north and south facing aspects graphically illustrating a complex interweaving of the two, which combined with climate, soil and aspect shape its unique character and the flora and fauna that thrive there. I am currently studying the humidity of my woodland where I consider it to be at its most damp and humid, and another where I feel it is most warm and dry. Taking readings at times of day when humidity is at a minimum and maximum, I hope to gain a picture of how the humidity fluctuates and the part moisture plays in this. If you have any suggestions meanwhile please contact me (link via contact us). Wet woodland, especially ‘carr’ woodland, is increasingly scarce and precious and grossly overlooked. It develops slowly over centuries and is a transitional stage in a long journey from a reedy swamp to forest. The name is derived from the Old Norse kjarr meaning swamp. It has a ‘primeval’ feel and offers an awe-inspiring experience of how a young woodland landscape may have looked thousands of years ago. On a visit to the Bialowieza Forest in Poland, we saw carr woodland that has probably existed since the end of the ice age. Carr presents as a water-logged terrain dominated by alder, willow and a tangle of shade-tolerant flora such as ferns, mosses, and brambles. In an undisturbed carr woodland large amounts of standing and fallen decaying wood support fungi, lichens and insects. Evaporation and splashes from standing and running water raise humidity. Fungi thrives and benefits woodland health by breaking down organic materials and releasing nutrients. Frequently characterised by dense verdant growth, moist woodland occurs especially where the sunlight reaches the woodland floor stimulating vigorous photosynthesis (see photosynthesis webpage). The dampness of the woodland will be influenced by many factors including annual rainfall, drainage, aspect, soil and protection from the drying effect of the wind. Running and standing water increase humidity in the understorey where there may be a rich diversity of flora including mosses and ferns along the edges of streams and beside still water in ponds and pools. Splashing water is particularly interesting, as the energy released raises local humidity and also provides essential oxygenation to the water. This is characterised by an obvious lack of water. If you think your woodland is dry, look again. 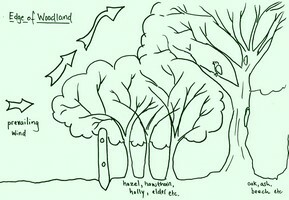 There may exist features such as ditches, dew ponds and small pools in the hollows of coppiced trees and decaying wood. A ‘dry’ woodland close to me in Wales has a small damp area where herb paris grows, indicative of moist conditions. Nature will locate these and we should observe why they are there. Without adequate water retaining the moisture, humidity levels may be low. The atmosphere ‘feels’ dry as the stream dries up when the water table is low. Shrubs, herbs and flowering plants may wilt and appear dull. Fungal activity is hindered as humidity from surface evaporation decreases, and the exchange of nutrients necessary for woodland health and diversity will be hampered. A mistake of conventional practice is making clearings that are too wide, as they are liable to drying out and bramble invasion (see article on glades for guidance). Where natural water features don’t exist, consider giving nature a helping hand by the creation of ponds and wetland. I have created several ponds through my woodland which I have dug where there was a possibility of water. A friend of mine in Oregon dug fourteen ponds in his forest to alleviate the dryness and had a brown bear come for a drink! Pond creation will encourage amphibians and other fauna and bring life to your woodland. As it gently evaporates in sunlight it will also increase local humidity. Dowsing can be a good way to locate hidden sources of water which, together with historical dowsing has proved useful. (see Dowsing website in references). Conversely, features such as ditches may be counter-productive contributing to drying the soil. My woodland, Coed Nant Gain in Wales, is a prime example. It is a steep sided glen or creek with north and south facing slopes and outcropping limestone. A stream running through the valley contributes significantly to the humidity, demonstrated by moisture loving plants. However, when the water-table drops the stream dries-up, noticeably reducing the humidity. The air in the drier parts of the valley becomes noticeably drier and the loss of greenness in the plants becomes particularly noticeable. The amount of water evaporating from the ponds varies depending on canopy cover and aspect contributing to humidity. The pond near my house is situated in a south-facing glade and captures a lot of sunlight through the day. The flora is lush. There is a wonderful diversity of fauna including insects, reptiles, amphibians, birds and mammals in this part of the woodland. So what should I conclude from all this? Start by considering ways in which to conserve your woodland from moisture loss. A dense shrubbery at the periphery is highly advisable to protect the interior from drying breezes, which would otherwise penetrate the woodland. *Be cautious when opening-up glades not to over-do it. Soil should retain sufficient moisture for healthy ground flora including seedling trees and shrubs. *Whatever your soil, a layer of decaying branches and leaf litter on the woodland floor acting like a blanket will help retain moisture and encourage recycling of nutrients. Evaporation will also be slowed as the warmth of the sun penetrates layers, thereby maintaining a more constant, gentler, local humidity over a longer period than a ‘fast burn off’ of rainwater by the sun. Despite the number of articles, especially on the internet and woodland visits, moisture is largely ignored to the detriment of woodland health and diversity. I would thus be grateful to hear from anyone about any aspect we may have overlooked. A Welsh primeval woodland stream. Plenty of decaying wood across it and diverse flora. Water in my stream (North Wales UK) splashing and tumbling over the rocks can increase the humidity. This is where the best ferns are to be found and other moisture loving plants. In Africa I have observed that in dry arid landscape where the spray from a waterfall drifts over the rocks, they are green with vegetation, particularly in shade. 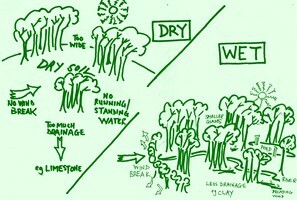 The essential characteristics of wet and dry woodland. 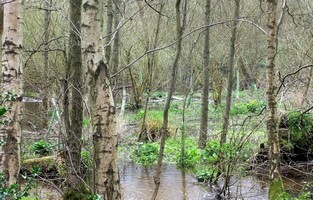 Alder carr has flooded valley floor and trees are standing in water. The larger trees have died making perfect site for woodpeckers to nest. Smaller trees are flourishing. In Wales the ground can be yellow with blossom. A blanket of snow acts as a quilt protecting the soil from drying in bitter winter weather. 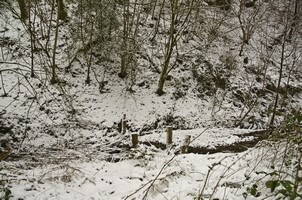 A log lying on the woodland floor may be frozen to the ground but the soil under the log is not frozen, protecting creepy crawlies and other fauna lodging there. 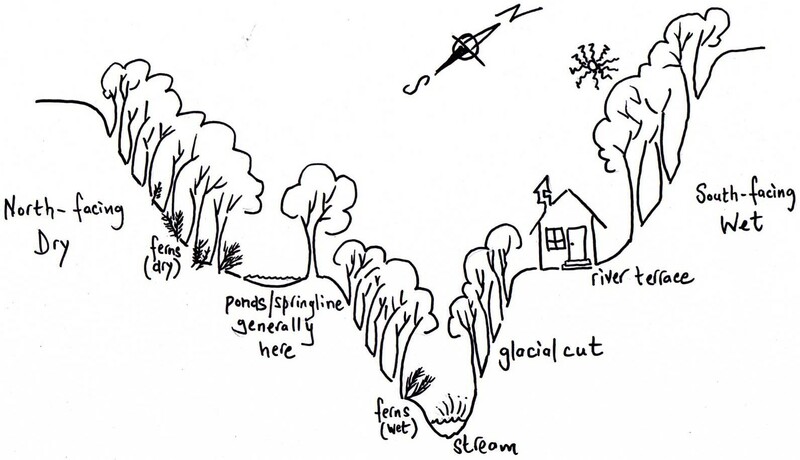 Sketch showing how trees and shrubs can provide shelter along the edge of the woodland, especially to the prevailing wind, preventing the woodland drying out. Water vapour rising in the warmth of the early morning sunshine.